LEE MACK - HIT THE ROAD MACK. Due to popular demand Lee Mack has added a third Blackpool date to his tour! The multi-award winning star of ‘Not Going Out’ and ‘Would I lie to you?’ Lee Mack is going back on the road with his first live tour in four years. Opera House, Church Street, Blackpool. 8pm. sleeping beauty. Jam-packed with smash-hit songs, stunning sets, fabulous costumes, exciting effects, lots and lots of laughs and plenty of seasonal sparkle. starring Jennifer Ellison (Dance Mums, Phantom of The Opera), BBC Radio Lancashire presenter and family favourite Steve Royle, Radio Wave’s Hayley Kay, Lewis Bradley (BBC’s Any Dream Will Do, Wicked ) and Nick Wilton (EastEnders’ Mr Lister). Grand Theatre, Church Street, Blackpool. 10.15am & 7pm. snow white and the seven dwarfs. Starring none other than, comedy legend Jimmy Cricket in the role of Muddles audiences are sure to be delighted both young and old, supported by Jim Whelan, Pete Lindup, Kristina Castellina, Adam Trembath, Yvonne Patterson and the Magnificent Seven. The Guild Hall, Lancaster Road, Preston. 7pm. 70s NIGHT GLAM ROCK. A festive return visit of Koo Ka Choo and the hits of Mud, Sweet, Slade, Bay City Rollers and many more. Includes three course meal. Sands Venue, Central Promenade, Blackpool. aladdin. Mooky and Mr Boo present this festive treat with a whole host of incredible stunts, jaw-dropping feats and comedy capers, not to mention the world-famous water finale. Blackpool Tower Circus. Tel: 0871 222 9929.
aladdin. Use one of your three magic wishes to see this pantomime, starring former Coronation Street heartthrob Scott Wright, as the genie. New scenery, new costumes and new faces in the professional cast, as well as plenty of audience participation. Lowther Pavilion, Lytham. Tel: 01253 794221. LIEUTENANT DAN. Welcome return visit of this fun pop/rock and party band with a huge repertoire and wide variety of songs ranging from the 70s right through to modern chart material. The Bar @ Toast, Wood Street, St Annes. wyreless acoustic. Jack’s Bar, Wood Street, St Annes. michael j. Duple Social Club, 96a Bond Street, South Shore. joe davies. Brun Grove WMC and Institute, 1 Brun Grove (off Ansdell Road), Blackpool. wayne gee. Hampton Road Social, Off Lytham Road, South Shore. the versions. The Layton, Westcliffe Drive, Layton. tnt. Bispham Con. Club, Red Bank Road, Bispham. scott dennette. Bloomfield Club, 128 Bloomfield Road, Blackpool. brad leigh scott. Brunswick Club, Bethesda Square, Blackpool. jack bennett. Thornton Cleveleys Wings Club. 135, Victoria Road West, Cleveleys. live poets And poetry people present a Christmas Caboodle. A copious concoction of classic contemporary poetry and prose, merry yuletide music and fruity festive punch. Central Library, Blackpool. 1.45pm-4pm, £1 entry. sleeping beauty. Jam-packed with smash-hit songs, stunning sets, fabulous costumes, exciting effects, lots and lots of laughs and plenty of seasonal sparkle. starring Jennifer Ellison (Dance Mums, Phantom of The Opera), BBC Radio Lancashire presenter and family favourite Steve Royle, Radio Wave’s Hayley Kay, Lewis Bradley (BBC’s Any Dream Will Do, Wicked ) and Nick Wilton (EastEnders’ Mr Lister). Grand Theatre, Church Street, Blackpool. 2pm & 7pm. snow white and the seven dwarfs. Starring none other than, comedy legend Jimmy Cricket in the role of Muddles audiences are sure to be delighted both young and old, supported by Jim Whelan, Pete Lindup, Kristina Castellina, Adam Trembath, Yvonne Patterson and the Magnificent Seven. The Guild Hall, Lancaster Road, Preston. 1.30pm & 5.30pm. ROBBIE WILLIAMS TRIBUTE NIGHT. Paul Reason and his band re-create all the hits of the former Take That member. Includes three course meal. Sands Venue, Central Promenade, Blackpool. bob on. Feating special DJ set from Danielle Stickley-Slater. Cricket Club, Stanley Park, Blackpool. 9.30pm. jeps. Highfield Social Club, Highfield Road, South SHore. monkberry. Strawberry Gardens, Poulton Road, Fleetwood. guns or roses. The Blue Room, Church Street, Blackpool. TOUCH THE PEARL. Last appearance here this year for the coast’s eight to10 piece soul, funk and groove outfit which has played major venues and events across the UK, Ireland and Europe, and supported acts as diverse as ELO and Edwin Starr. The Bar @ Toast, Wood Street, St Annes. wyreless acoustic. Merrie England, North Pier, Blackpool. rock o rama. Stanley Ward Conservative Club, 92 Common Edge Road, Marton. johny norton. Fleetwood Working Mens Club, Kemp Street, Fleetwood. jason j. Stanley Road WMC, Stanley Road, (off Hornby Road), Blackpool. jaydon roberts. Duple Social Club, 96a Bond Street, South Shore. corinne lori. Brun Grove WMC and Institute, 1 Brun Grove (off Ansdell Road), Blackpool. rob johnson. Hampton Road Social, Off Lytham Road, South Shore. the people and atmospherics. The Layton, Westcliffe Drive, Layton. paul parsons. Claremont Conservative Club, Westminster Road, Blackpool. karen jay. Blackpool’s Number One Club, Bloomfield Road, Blackpool. la belle. Bispham Con. Club, Red Bank Road, Bispham. leon britton & brian sharpe. 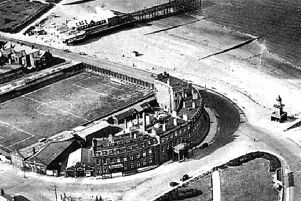 Bloomfield Club, 128 Bloomfield Road, Blackpool. fabbalicious. Thornton Cleveleys Royal British Legion, Rough Lea Road, facing Cleveleys Bus Station. timeless plus emma james. Cleveleys Men’s Club, Slinger Road, Cleveleys. john malcolm. Brunswick Club, Bethesda Square, Blackpool. stephanie. Knott End WMC, Salisbury Avenue, Knott End. wayne lester. St Annes Conservative Club, 314 Clifton Drive North, St Annes. the jeps. Highfield Road & Rec., 79 Highfield Road, South Shore. roger gabriel. Blackpool Catholic Club, 30 Queen Street, Blackpool. jason lee. Thornton Cleveleys Wings Club. 135, Victoria Road West, Cleveleys. santa’s merrie wonderland christmas family show. The Merrie England, North Pier, Blackpool. 1pm-4pm. leye d’s christmas cabaret. It’s the time of year to eat, drink and be merry with comedy as well as a mixture of seasonal song and dance! Starring Leye D Johns, Phil Jeffries, Emma Wright and the gorgeous VIVA Showgirls – it’s a show full of festive favourites, music everyone will love and lots of Christmas Comedy. Viva! Blackpool, Church Street, Blackpool. 7.30pm. KEITH HARRIS AND ORVILLE. The final Sunday visit to the venue for the ever popular ventriloquist and his sidekick (not forgetting Cuddles the Monkey) with a Christmas matinee special. With or without meal. Sands Venue, Central Promenade, Blackpool. 80s GOLD. Special Sunday evening visit from the “ultimate 1980s tribute show” featuring music made famous by ABC, Spandau Ballet, Duran Duran, ABC and others. Includes three course meal. Sands Venue, Central Promenade, Blackpool. THE KEYTARS. One of the area’s most popular rock and pop cover bands with a special Sunday session. The Bar @ Toast, Wood Street, St Annes. kev rees owen. Duple Social Club, 96a Bond Street, South Shore. nigel miles. Brun Grove WMC and Institute, 1 Brun Grove (off Ansdell Road), Blackpool. bob morgan. Hampton Road Social, Off Lytham Road, South Shore. nikki miller. Bispham Con. Club, Red Bank Road, Bispham. stacey rafferty (lunch), charlotte james (eve). Bloomfield Club, 128 Bloomfield Road, Blackpool. finbarr smith. Cleveleys Men’s Club, Slinger Road, Cleveleys. mark andrew smith and tracey jordan. Brunswick Club, Bethesda Square, Blackpool.